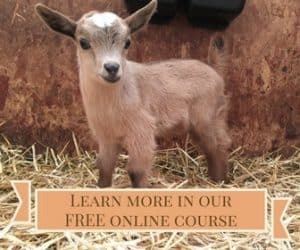 One of the advantages that goats have over cattle, sheep, and pigs is that the equipment and infrastructure required for them is not nearly as costly. Goats were the first livestock we bought after chickens, and we had to buy very little equipment for them. When we added other livestock, however, we quickly learned that we would need to upgrade our infrastructure to properly contain them. Cattle require heavy-duty steel handling equipment, which is very costly. Although ewes are not any harder to keep than goats, the rams are very hard on housing and gates. The first time we put a ram in one of our buck pens, he put his head down, ran straight for the gate and busted right through it. Pigs also tend to tear up a lot of buildings and fencing simply by rubbing on it. 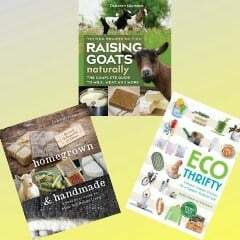 You will probably discover that goats are easier to keep than you imagined. Many people who live in northern climates assume they will need insulated and heated barns for their goats in the winter. However, goats grow a thick, fuzzy undercoat of cashmere to keep them warm during the winter, so adults are usually fine in unheated barns in most of North America. If kids are born in freezing temperatures, someone should be there to get them dried off as quickly as possible so they don’t get hypothermia and their ears don’t get frostbitten while still wet. Once kids are dry, they are fine down to around zero degrees Fahrenheit. Goats need to be protected from snow, rain, and wind because these things will cause a lot more stress than cold temperatures alone. Unlike sheep and cattle, goats seem to think they will melt if they get wet, so most of them will start to scream wildly if it starts raining when they are outside. Three-sided shelters in the pasture are ideal because the goats can get out of the rain and wind, but they still have fresh air. A three-sided shelter works well for buck housing. Just be sure that the opening is on the opposite side of the building from the prevailing winds during the winter. For us, the openings are on the south side. However, when we had a blizzard a few years ago, we brought the bucks into the barn, and we were very happy we did because the three-sided shelters filled up with snow. If you don’t have a backup housing plan for bucks, use bales of straw in front of the opening in case of a blizzard. 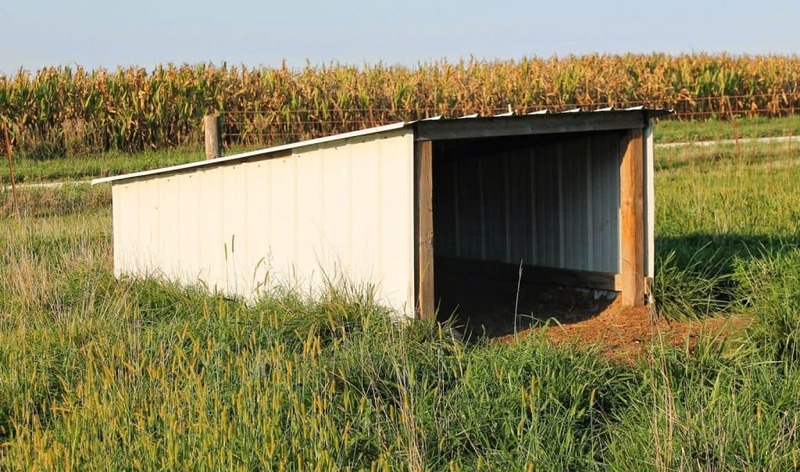 A barn with big, heavy doors that you have to open and close to allow goats to go in and out can be modified by cutting a smaller, goat-sized door into the side of the barn so that the goats can come and go as they choose when there is threat of rain or other inclement weather. In general, however, the goats should be outside during the day, where they can get fresh air. I recently bought a 3 acre place in the high desert. Goats love this area but it is hot over 100 four months of the year and cold 4 months of the year. The solution for me was a barn with a big door to muck out the bedding and a Dutch door that they can use to go in and out. During the summer I have a small swamp cooler in the barn. 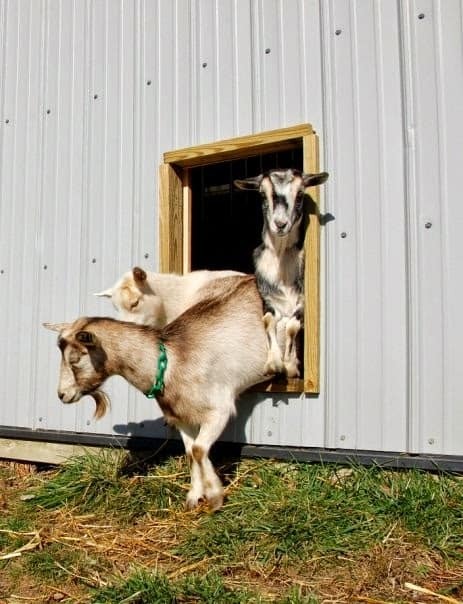 I leave the bottom of the door open for the goats, and I can open the top when I want to go to the goat yard for chores. We have big winds here up to 80 miles an hour, and they are very dust. Thankfully these last less than 24 hours. So during these I can house the goats and kids in the barnext and everyone is protected.